Actual unloaded weight of a vehicle is the empty (tare) weight of the vehicle. A trailer or semitrailer is treated as customarily used in connection with a vehicle if the vehicle is equipped to tow the trailer or semitrailer. For buses, taxable gross weight is its actual unloaded weight fully equipped for service plus 150 pounds for each seat provided for passengers and driver. According to the IRS, the weight declared for registering a vehicle in a state may affect the taxable gross weight used to figure the tax. State registration by specific gross weight - If the vehicle is registered in any state that requires a declaration of gross weight in a specific amount, including proportional or prorated registration or payment of any other fees or taxes, then the vehicle's taxable gross weight must be no less than the highest gross weight declared for the vehicle in any state. 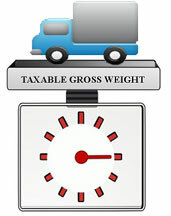 If the vehicle is a tractor-trailer or truck-trailer combination, the taxable gross weight must be no less than the highest combined gross weight declared. State registration by gross weight category - If the vehicle is registered in any state that requires vehicles to be registered on the basis of gross weight, and the vehicle is not registered in any state that requires a declaration of specific gross weight, then the vehicle's taxable gross weight must fall within the highest gross weight category for which the vehicle is registered in that state. State registration by actual unloaded weight - If the vehicle is registered only in a state or states that base registration on actual unloaded weight, then the taxable gross weight is the total of the three items listed under Taxable Gross Weight above.